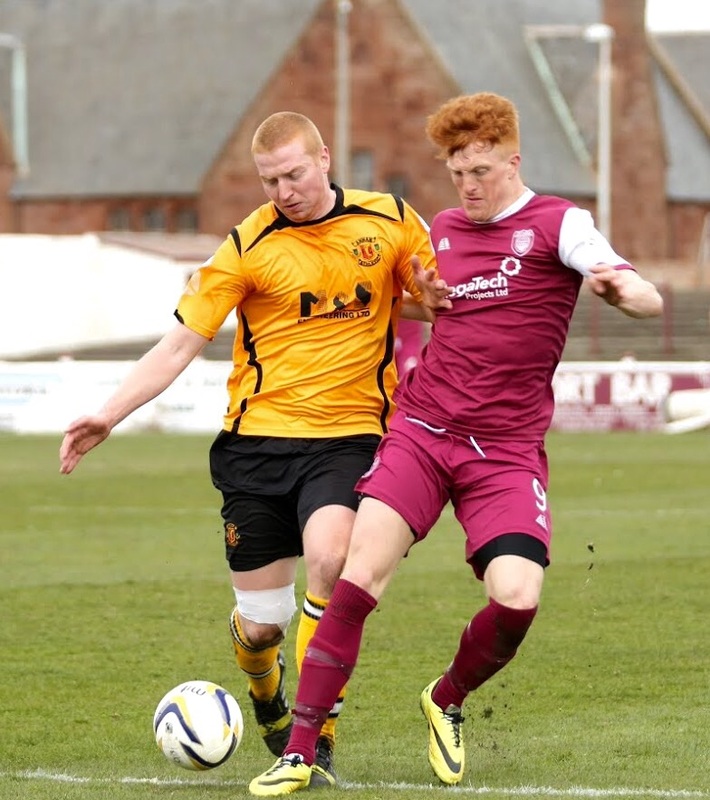 Annan Athletic grabbed a precious point against play off hopefuls Arbroath to retain their slim chances of a play off place. There was very little to pick between the teams and at the end of the day a draw was possibly the result which both teams deserved but Annan, will no doubt look back on the goal that they conceded in the 67th minute as decisive moment in the match when a moment of misjudgement by Martin McNiff presented Simon Murray with an opportunity that the Arbroath striker grabbed to earn his club a share of the points. Annan started the game in 3-4-3 formation with Steven Black returning after suspension to slip alongside Watson and Swinglehurst in the back 3 and with Andrew Mitchell back on the right hand side of the midfield the Annan team had a more balanced look about it than the side that struggled miserably against Clyde the previous week. Annan started the game brightly with keeper Marc McCallum averting a scoring opportunity to deny Kenny MacKay in the 3rd minute, this was followed by a Stuart McColm effort which went narrowly past the post. Arbroath’s first real opportunity was as a result of a free kick conceded wide on the right but Swinglehurst averted the danger from Linn’s cross, heading past the post for a corner kick. Kenny MacKay presented Stuart McClolm with a great chance in the 23rd minute when he released McColm one on one with McCallum but the keeper saved the day for Lichties. At the other end Thomas Grant hit an effort into the side netting after a break from defence by the home team. Annan were unlucky not go ahead in the 30th minute when McColm’s well placed shot cracked the base of post and MacKay followed up but blasted wide of the target. It was a real let off for Arbroath but Annan then had a real scare at the other end when Mitchell denied Simon Murray and Swinglehurst did great to scramble the ball clear for a corner kick. After a disappointing first half Arbroath started the second half with far more purpose and inside a couple of minutes Alex Mitchell pulled off a good save to deny Linn. It was however Annan who went ahead and it was a rare mistake by Kevin Nicoll who misjudged a challenge wide on the left and Kenny MacKay did great to pick the ball up and make a bee line for the goal, finishing by slipping the ball past McCallum from an acute angle. McCallum then pulled off a good save when he smothered Todd’s 54th minute effort. Arbroath were then denied a goal when Grant’s shot struck the post in the 65th minute but 3 minutes later the game was all square. It was moment in the match which Martin McNiff will want to forget quickly as his attempted back header to Alex Mitchell was intercepted by Simon Murray who had the simple task of slipping the ball past Mitchell and into the net. Both teams made changes in an effort to win the game and Ogen’s first touch in the 72nd minute was to set up MacKay but the disappointing effort went wide and high and a minute later Ogen’s effort from the edge of the box was easily saved by McCallum. Steven Logan’s first touch after his introduction for Ryan McStay in the 84th minute was a shot over the bar and Ogen’s 88th minute strike went close . ANNAN ATHLETIC: Alex Mitchell, Steven Black, Martin McNiff, Peter Watson, Steven Swinglehurst, Andrew Mitchell, Steven Sloan ,Ryan McStay (Steven Logan 84 min), Josh Todd, Kenny Mackay ( Chris DickInson 88 min ), Stuart McColm (J Ogen 71 min). SUBS NOT USED: Jake Gemmel, Connor Liddel, Callum Cook, Jordan Brown.